Pall Corporation, a global leader in filtration, separation and purification, today announced the introduction of the GeneDisc® Rapid Microbiology System for advanced microbial quality monitoring. This system represents Pall’s latest quality assurance innovation for the pharmaceutical manufacturing industry. Typical culture-based methods may need at least five days to produce results. Pall’s GeneDisc System generates comparable results for most microbiological applications in just a few hours. The advantage provided by the GeneDisc System shortens the manufacturing cycle for pharmaceutical manufacturers, reducing warehousing costs, improving product time to market, and increasing ROI throughout the production process. The GeneDisc Rapid Microbiology System represents Pall’s first step in providing a complete qPCR platform for rapid microbiology analysis. 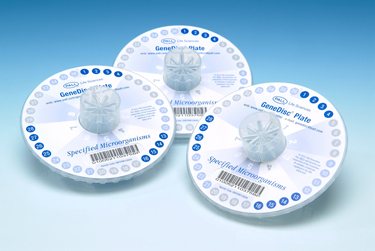 The GeneDisc Rapid Microbiology System is efficient and easy to use. Its novel, highly simplified technology, based on bar-coded data input and fewer operator-dependent steps, ensures reliable results that significantly reduce the risk of user error. The economic design of the GeneDisc System also offers the unique advantage of moving assays to an operator with relatively modest training, freeing up technically skilled staff for more demanding duties. This new application in Pall’s GeneDisc product group is based on established quantitative polymerase chain reaction (qPCR) technology, which provides a simple, rapid tool for microbiological analysis. This single-protocol solution yields highly reproducible results with simplicity, speed and security, enabling quality control testing to be executed on a much shorter timetable than by using traditional methods. The first of these assays is a Specified Microorganism Test, which simultaneously detects indicator pathogens as required by Pharmacopeia. Results are obtained within hours and not the several days required by traditional microbiology methods. Additional assays are planned that will further expand the GeneDisc System to perform accelerated microbiological testing during various stages of pharmaceutical and biotech production. “Typical methods of sample analysis often require three to five days to detect contamination,” says Dr. Peter Ball, Technical Marketing Director for Pall Life Sciences. “That can mean scrapped or reworked product, which represents considerable risk and cost. With the GeneDisc System, we can reliably eliminate those production risks in just a few hours,” Ball says. Amelia G. Tait-Kamradt, a Scientist at Pfizer, Inc., will present, “Using a Novel qPCR Platform to Accelerate Pharmaceutical Microbiology Testing,” a whitepaper highlighting the advantages of the GeneDisc System at the Parenteral Drug Association’s 5th Annual Global Conference on Pharmaceutical Microbiology, October 26, in Washington, D.C. For more information on the GeneDisc Rapid Microbiology System or any of the other Pall Corporation life sciences solutions, visit www.pall.com/biopharm.